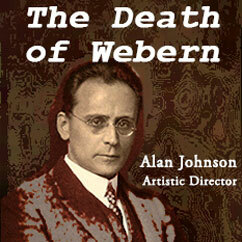 The Death of Webern is published by American Composers Alliance. The Death of Webern was performed and recorded in April, 2015 by faculty, alumni and students at the Frost School of Music, University of Miami, with Alan Johnson conducting. It was released on Albany Records, January 1, 2016. 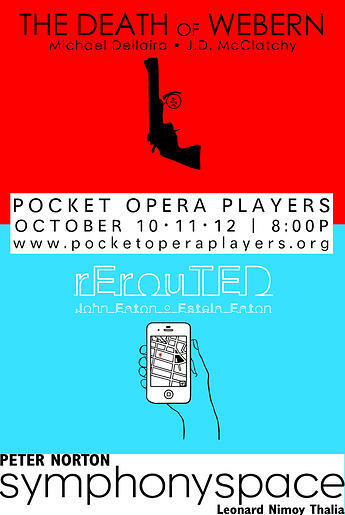 The Death of Webern was commissioned by The Pocket Opera Players. On September 15, 1945, a mere five months afte the fall of Berlin, the composer Anton Webern and his wife Wilhelmine went to have dinner with their daughter Christine and their son-in-law Benno in the Austrian village of Mittersill. The town was still occupied by American troops, and they suspected Benno of selling illegal contraband. In fact, they planned to arrest Benno that very night, but Webern knew nothing about this. After dinner, he stepped out onto the porch to smoke a cigar. As he was about to light it, he bumped into one of the G.I.s surrounding the house. There was the sound of a scuffle, then gunfire. Webern, stumbling back into the house, told Wilhelmine, “I am hit.” He died shortly after. News of Webern’s death traveled quickly in the musical world, with the usual embellishments and distortions that accompany all shocking reports: Webern had refused an order to halt; Webern had run away; it was Benno, a Nazi sympathizer, and not an American G.I. who had shot Webern. Over the next ten years, a number of articles would be written about the tragic event by such musical figures as Humphrey Searle, Robert Craft, and Rene Leibowitz. All noted the irony that Webern – a quiet, introspective and peaceful man — should die under such curious and violent circumstances, but nobody would know what actually happened in Mittersill that night until the publication of Hans Moldenhauer’s book in 1961, The Death of Anton Webern: A Drama in Documents (Philosophical Library). By the following year, at the first Summer Course for New Music in Darmstadt, Webern had already become a tragic figure. Schoenberg may have provided a new method of composing with 12-tones, but at Darmstadt it was Webern who was deemed the far-thinking futurist. Today, Webern’s music is rarely studied, talked about or played. (I recently met students from three major conservatories, none of whom had ever heard a note of his music.) And in this age of ubiquitous public utterance, Webern’s private and careful contemplation of music’s properties, his devotion to a system of composition and his solitary efforts to understand that system in the context of four hundred years of music history, from Gregorian Chant to Dodecaphony, may seem rarified and academic, even quaint. So while The Death of Webern is about the senseless, mysterious killing of an innocent man, it’s also the story of the rare artist– composer, painter, poet– for whom the discovery of an idea in private creates more joy than mere public celebrity; the rare artist who, like Webern, finds that doing the work itself is the best, and sometimes only, reward. I am indebted to film-maker and director (and friend) Marco Capalbo, whose screenplay about Anton Webern’s death, “Paths to Light”, while substantially different from this opera, was nevertheless a source of inspiration.